Early in the morning of Sept. 9, Travis Morris, 32, was driving near the corner of Garden and Marsh streets in San Luis Obispo. A CHP officer discovered Morris was driving with a vehicle code violation and conducted a traffic stop. The CHP officer then determined Morris was driving under the influence of alcohol. Morris declined a breathalyzer, instead electing to have a blood test to determine his blood alcohol level. The officer cited Morris for driving under the influence and released him to a friend. An Individual who is arrested for DUI who has a valid driver’s license, no past DUIs and a sensitive position or condition can be picked up from the scene, according to the CHP. Morris was placed on paid administrative leave following his arrest. 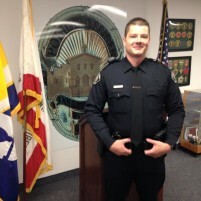 San Luis Obispo police say Morris is no longer employed by the police department, as of Oct. 12. Ask his fiance’ Tara Heckman (possibly mistress). Saw him in child support court where he had a bench warrant for failure to pay child support (on a slo pd salary?). Some people just can’t get over it…..you STILL have a hard on for Mason huh? This just one more dirty cop, in a very long list of local corrupt LE’s, SLO PD has the highest numbers of Police arrested, convicted, fired , given early retirement. Let alone the list of settlements of poor police conduct, the alleged disbandment of the SET, MTM, GTF, NTF, SLONET etc. Limon, Crammer, McDow, Cory Pierce, Travis Morris, AJ Santana and oh so many more, including X Chief Gesell, the SLO PD is currently in the most dysfunctional state it has ever been, a ship without a captain sailing in uncharted waters who in charge ? I got a letter (Form) from the now this month wannabe acting Chief Keith Storton we need a real chief not a wannabe unqualified acting one who lies and covers up evidence and fails to send officers to a 911 call. A video clearly shows some serious violating of law yet SLO PD failed miserably. Today Agent Rosa from another agency in now the the case SLO PD tried to cover up. I now have NO trust in the phony command now wasting our tax dollars, we need a real Chief no more liars or those who cover up dirty cops. And just how big was his go away package? What does how big his “package is” have to do with anything? omg!